Clu breaks down the Western bracket, bringing his first and second round predictions to an end. I hope you’ve been printing these out and highlighting… a lot! 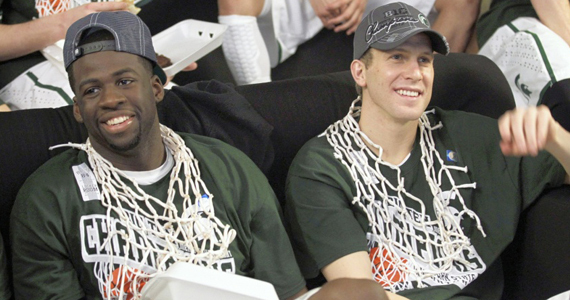 If you want a sure bet for the Final Four, you should take a good look at Michigan State. they’re getting hot at the right moment, which seems to always happen to Tom Izzo’s squad around this time of year. MSU’s defense, one of the strongest in the nation, is strong, versatile and brutal against opponents. They aren’t the best three-point shooting team around, but they should be able to drop the hammer on LIU down low. This could cause a problem for the LIUB, as they are primarily a shooting team. The Blackbirds rank in the lower 3rd in almost every major defensive category though, so if they some how just manage to outshoot the Spartans and draw them away from the basket, they could cause some headaches and possibly upset the Spartans (side note: a #16 seeded team has never beaten a #1 seed before in the history of the NCAA tournament). Memphis comes in after winning the C-USA crown for the sixth time since 2004, and they are one of only a handful of teams who have the ability to win with a ton of young talented sophomores (known as the Super Sophs). 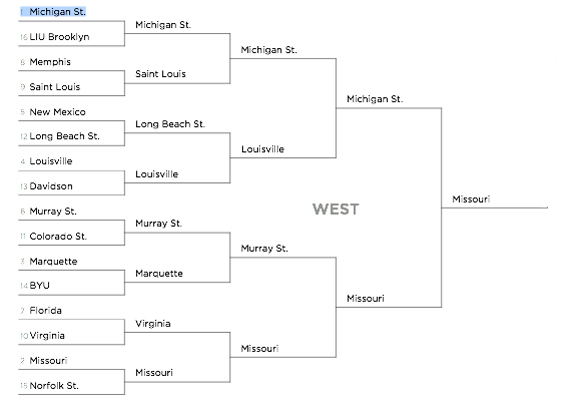 St. Louis, meanwhile, has a tough task to handle against the Tigers if they want to slip away with an upset. The Billikens are very strong defensively, and they only allowed 0.88 points per possession this season (12th in the country). Their stout man-to-man defense and quick hands helped them surpass the national average turnover margin (23% for the year). The Lobos are one of those teams who seem built to win in the post season. They have yet another fantastic defense, good three-point shooting percentage (38.5%) and they know how to grab rebounds. Keep your eye on Drew Gordon, because he is the key if they want to win (unless he gets into foul trouble which he is known to do). Long Beach State, on the other hand, had one of the most difficult non-conference schedules in the country. They played competitive ball all season and even beat Pittsburgh and Xavier. They also played tough against Creighton, San Diego St. and Kansas, even though they lost. Even with those losses, the 49ers have a boatload of leadership, offense and defense, and they do not bow down to pressure. Hey, the ‘Niners could pull off a first round upset. A late surge in the Big East that started in mid-january helped the Cards cap off their second big east tournament title in four years, Coach Rick Pitino has this team playing stellar defense, as the Cardinals had a 0.84 points per possession average, which happened to be the second best in the country. Their main concern will be shot management, as they are known to take some wild shots. If they can find some consistency with their shooting, the Cardinals could make a final four run. Meanwhile, Does anybody remember Davidson from four years ago? Their Elite 8 run with Stephen Curry? Anyone!? Well, it just so happens that they’re doing it again in 2012. This time, however, they’re doing it with a 6’10” behemoth named Jake Cohen. This guy is one of the most versatile players on Davidson, as he and De’Mon Brooks both averaged over 14 points and 6 rebounds per game. Be careful here, because this team has the ability to play spoiler yet again. Ah Murray State, one of those fantastic mid-major programs that I mentioned a few times throughout the year. They would have had a perfect 31-0 season had it not been for Tennesse State. Anywho, the Racers are one of the most lethal three point shooting teams in the nation. In particular, guard Isaiah Canaan shoots 47.3% from three-point land. Colorado State is yet another great outside shooting team, as they have connected for 41% from beyond the arc this season. 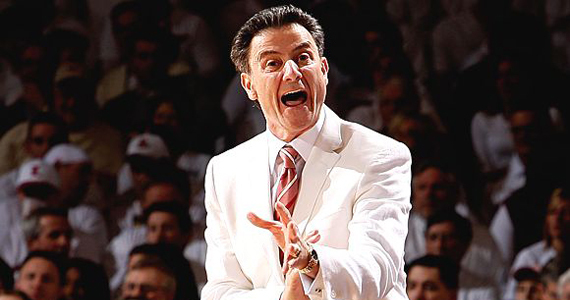 They show that aggressive spirit that gets them to the line, and they converted over 76% of their free-throws. Do I think this team has what it takes to pull of an upset over a mid-major school? As sad as it sounds, probably not. Colorado was pretty lucky to even get an invite, as there could have been other schools in this spot…be grateful Rams…very grateful. The Golden Eagles built off of what they learned from their second round upset win over Syracuse last year, becoming one of the most athletic, physical and gritty teams in the Big East in 2011/2012. Watch out for Jae Crowder and guard Darius Johnson-Odom, as these two players will be key to the Golden Eaglers success in this tournament. Meanwhile, BYU comes in with many stellar offensive stats, good all-around shooters on the team, and the momentum of a 25-point comeback victory in the play-in game. They are led by Forward Noah Hartsock (16.7ppg), and they fit the typical profile to be a Final Four contender. HOWEVER… They have to show that they can hang with top 25 teams, as they were only 1-3 against them on the year. Can Florida find their winning ways again? This is a team that is just five years removed from two national championships and an elite 8 appearance. They have a bunch of young kids who can knock down three-pointers all day, but play very flimsy defense. Get someone in their face and it could be all over for them. Viginia, on the other hand, plays a very strong half court game Overall. The Cavs rank in the top 20 in three defensive categories (field goal, three-point, and defense rebound percentage). 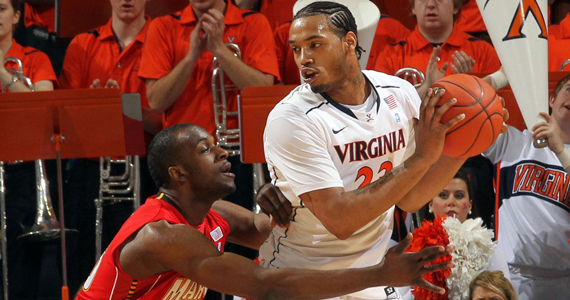 Keep your eye on Forward Mike Scott, as he is their go-to guy in the paint, and an excellent all-around player with NBA potential. Missouri boasts a strong shooting team, but a so-so defense, and it was made very clear in their earlier games this year against Kansas State (two losses). the Tigers are a “guard-heavy” bunch that can and will pile on the points, but lack a presence in the paint. The other Spartans (Norfolk State) won the first MEAC tourney title in school history, and how are they rewarded? With probably a thank you and a good bye, as they have to face Missouri in the first round… thats nice of the NCAA committee. These Spartans also have their fair share of turnovers and are ineffective at shooting threes, so they better hope to apply some pressure on the defensive side of things if they want to stand a chance against the Tigers. Prediction: I dont care how many top ranked teams LBS has played, Louisville is a tough cookie to beat. Cardinals win. Prediction: Mid Major powerhouse prevails. Murray State! Now you’re ready to win your office pool!